Md Eunusur Rahman, Senior Secretary, Banking Division, Ministry of Finance, inaugurating the online version of International Financial Reporting Standards (IFRS) and International Standards on Auditing (ISA) at ICAB in the capital recently. The Institute of Chartered Accountants of Bangladesh (ICAB) signed an agreement with IFRS Foundation for supply of data for adoption and publication of IFRS and IFRS for SMEs (for both print and electronic format) in the capital recently, says a statement. Chairman of International Accounting Standards Board (IASB) Hans Hoogervorst inked the deal. 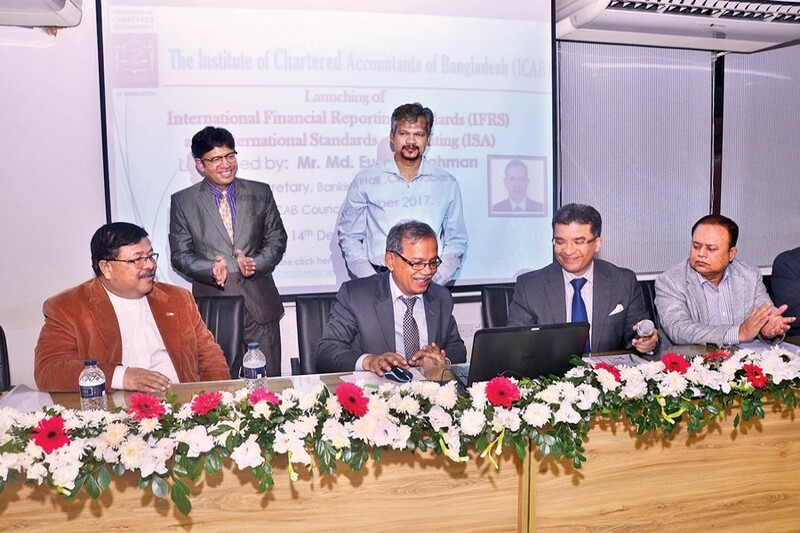 Senior Secretary, Banking Division, Ministry of Finance, Md Eunusur Rahman inaugurated the online version of International Financial Reporting Standards (IFRS) and International Standards on Auditing (ISA) at ICAB recently. The ICAB has adopted the IFRS and IFRS for SMEs which will be effective for annual period beginning on or after January 1, 2018. The Institute at the same time also adopted ISA and other relevant standards and pronouncements which will be effective for audits of financial statements for annual periods beginning on or after January 1 2018, said the statement, adding this means from that effective date Bangladesh Financial Reporting Standards (BFRS) and Bangladesh Standards on Auditing (BSA) will be replaced by these IFRS and ISA.